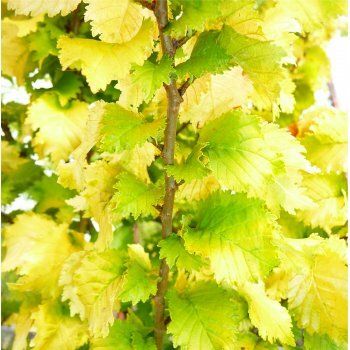 This lovely conical elm with upright branches boasts crinkly-edged, bright yellow foliage in spring and summer, which adopts a rich shade of gold in the autumn. Ulmus X Hollandica has an estimated height and spread of 4 x 2 metres in 20 years and prefers a moist, well-drained soil in full sun. Wredei attracts a variety of different wildlife including several species of moth and butterfly. A lovely tree to brighten a dark corner with its intense yellow leaves. Our pot grown Upright Golden Elm trees can be planted at any time of the year. Firstly, remove all weeds and grass within a metre of your desired planting hole. Dig a hole as deep as your root mass and approximately 2x as wide. To help your tree establish more effectively, we advise applying root grow (sprinkle in the hole for pot grown trees). When planting Uprright Elm trees in spring or summer, water well and regularly for the first few months. Keep an eye on the tree and if there are extended periods of hot or dry weather, increase watering. When planting in autumn, you may only need to water a little. You can use an irrigation kit to assist in watering. Dutch Elm trees do not require regular pruning. If you wish to tidy up your Dutch Elm, do this during the dormant season. Focus on removing any damaged, diseased or overcrowded branches. If you require a clear trunk, remove any side shoots to help raise the crown.